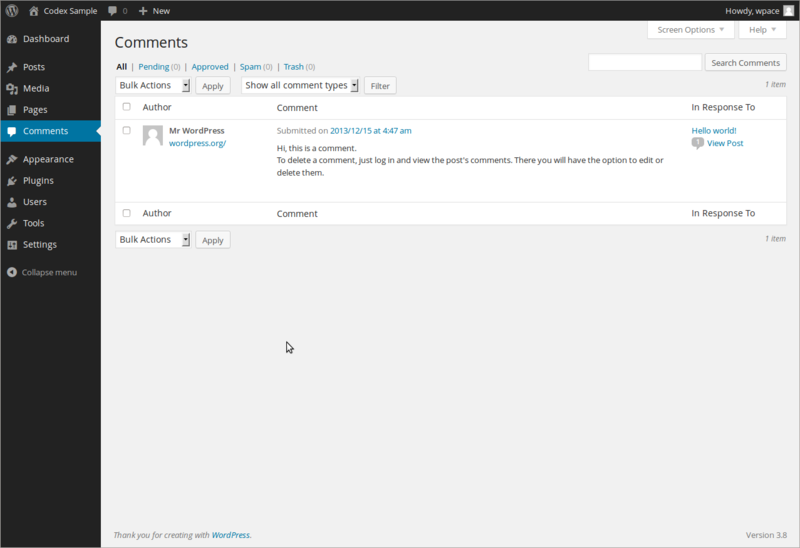 The Table of Comments displays all the comments, with the most recent comment displayed first. In the instructions that follow, reference is made to using a mouse to click on fields and links, but the Keyboard Shortcuts article describes the various keyboard combinations that will allow navigation and management of comments without using the mouse. [ ] – This checkbox, when clicked (checked), ‘selects’ that particular comment to be processed by aBulk Action. Gravatar – This is a picture orgravatar of the comment author. Author – This is the name of the comment author. Below the comment author name is the comment author’s email address that can be clicked to begin an email to that address. Below the email address is the commenter’s web-site in the form of a URL that can be click to visit that commenter’s web-site. Below the email address is commenter’s IP address in the form of a link. Clicking that IP address link causes all the comments originated by that IP address to be displayed thus allowing a Bulk Action to be applied to all comments from that address. Comment – The first item in this column is the comment date and time presented as a link. Click the date and time link to allow the comment to be edited in the Comments Edit Screen. Below the date and time is the actual comment that was submitted, and below that is the Immediate Actions that can be performed on that comment. In Response tT – This column displays the title of the post related to the comment. Click the post title to edit that post. Below the post title, a comment bubble depicts the number of comments made to the post. Place the mouse cursor (Hover) over the comment bubble to see how many of the comments are in a Pending state. And finally, next the comment bubble, a # (pound sign/hash symbol) is displayed as a link to see a single post view of the post related to the comments.